I have installed MySQL Community Edition 5.5 on my local machine and I want to allow remote connections so that I can connect from external source. That is allowed by default on MySQL. And then find the following line and comment it out in your my.cnf file, which usually lives on /etc/mysql/my.cnf on Unix/OSX systems. In some cases the location for the file is /etc/mysql/mysql.conf.d/mysqld.cnf). If it's a Windows system, you can find it in the MySQL installation directory, usually something like C:\Program Files\MySQL\MySQL Server 5.5\ and the filename will be my.ini. And restart the MySQL server (Unix/OSX, and Windows) for the changes to take effect. After doing all of above I still couldn't login as root remotely, but Telnetting to port 3306 confirmed that MySQL was accepting connections. I started looking at the users in MySQL and noticed there were multiple root users with different passwords. So in MySQL I set all the passwords for root again and I could finally log in remotely as root. Just a note from my experience, you can find configuration file under this path /etc/mysql/mysql.conf.d/mysqld.cnf. In my case I was trying to connect to a remote mysql server on cent OS. After going through a lot of solutions (granting all privileges, removing ip bindings,enabling networking) problem was still not getting solved. As it turned out, while looking into various solutions,I came across iptables, which made me realize mysql port 3306 was not accepting connections. Here is a small note on how I checked and resolved this issue. Please follow the below mentioned steps inorder to set the wildcard remote access for MySQL User. (2) navigate to path C:\Program Files\MySQL\MySQL Server 5.X\bin and run this command. (3) Enter the root password. (4) Execute the following command to provide the permission. USERNAME: Username you wish to connect to MySQL server. 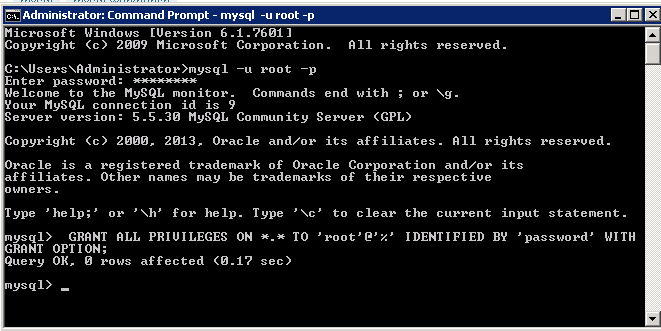 IP: Public IP address from where you wish to allow access to MySQL server. PASSWORD: Password of the username used. IP can be replaced with % to allow user to connect from any IP address. (5) Flush the previleges by following command and exit. If you installed MySQL from brew it really does only listen on the local interface by default. To fix that you need to edit /usr/local/etc/my.cnf and change the bind-address from 127.0.0.1 to *. Then run brew services restart mysql. If your MySQL server process is listening on 127.0.0.1 or ::1 only then you will not be able to connect remotely. If you have a bind-address setting in /etc/my.cnf this might be the source of the problem. You will also have to add privileges for a non-localhost user as well. For whom it needs it, check firewall port 3306 is open too, if your firewall service is running. Just F.Y.I I pulled my hair out with this problem for hours.. finally I call my hosting provider and found that in my case using a cloud server that in the control panel for 1and1 they have a secondary firewall that you have to clone and add port 3306. Once added I got straight in..
And for OS X people out there be aware that the bind-address parameter is typically set in the launchd plist and not in the my.ini file. So in my case, I removed <string>--bind-address=127.0.0.1</string> from /Library/LaunchDaemons/homebrew.mxcl.mariadb.plist. If mysqld has a bind address set to a loopback/local address (e.g. 127.0.0.1), the server will not be reachable from remote hosts, because a loopback interface cannot be reached from any remote host. Set this option to 0.0.0.0 (:: for IPv4+6) to accept connections from any host, or to another externally-reachable address if you want to only allow connections on one interface. How to find MySQL ip on localhost?